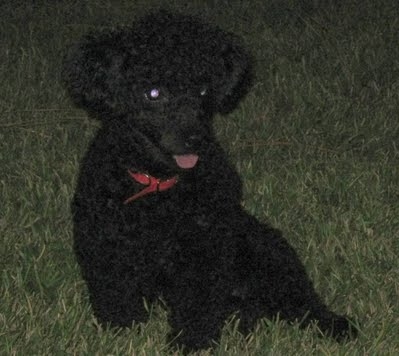 Toby - Diamond in the Ruff Rescue & Rehab, Inc.
Toby is a poodle who came to us from a breeder along with his family. He was used as a stud and didn't have much human interaction until the puppy mill got invaded and they got rescued. 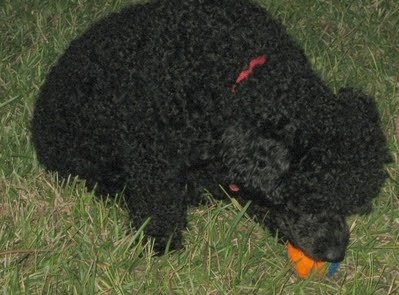 He was adopted in September 2009. 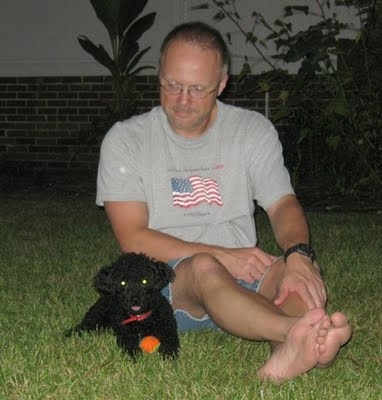 Now Toby can enjoy simple pleasures, like sitting on the grass and walking through pet stores sniffing everything! We just wanted to let you know that Toby has had a ball of a weekend with us. Before we came home on Friday night, we stopped at the Pets warehouse store and Toby was able to walk in with us on his leash. He was like a kid in a candy store and to tell you the truth so were the two of us. He walked up and down the aisles looking at the stuff on the shelves and everyone was stopping and checking him out. We got him is dog food and just like any parents who has kids we bought him some toys to play with. After getting him home we went into the back yard with him and he walked around a little then he started rolling in the yard like he had been here before. Saturday we just spent the day adjusting to each other and having a ball. It did not take him 4 days to do his job he was doing it on Saturday. We were able to get him to go potty outdoors. He does pretty good walk around the neighborhood on his leash. He is still a little squeamish but it is all new to him. He has met his neighbors and they just fell in love with him just like we have. He plays catch with a ball outdoors and he plays with his stuff animals inside the house. He has been nothing but a joy to us since we left for home on Friday. He even sleeps in the bed! He does have a vet appointment for Friday morning then we will be getting him an appointment to get him groomed. I have enclosed a few pictures for all of you to look at and will send some more pictures later. I am glad I was able to come across his picture and we greatly appreciate you being able to rescue this precious little boy! He has put the spark back into our lives in more ways that we can ever think.